A woman says a bullet flew through her bedroom window over the weekend while she was having a Friendsgiving dinner. 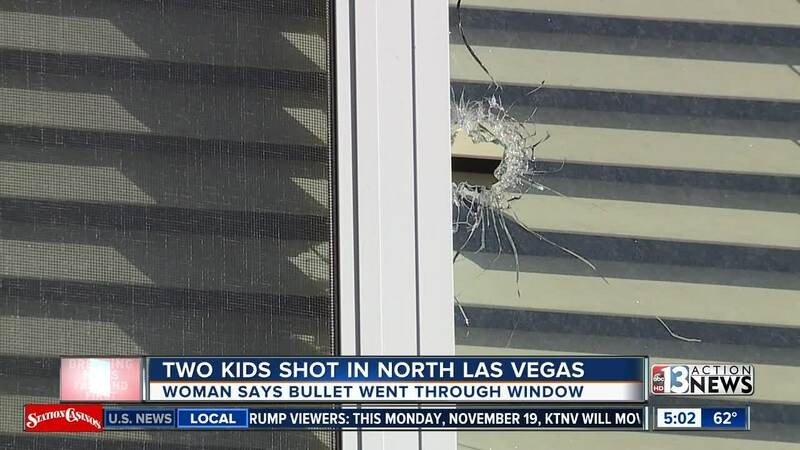 A North Las Vegas woman says a bullet went flying through her home over the weekend while she was hosting a Friendsgiving dinner. Pictures show the damage inside and outside the home. The woman’s home is less than a mile away form where a 16-year-old boy was shot and killed last week, near Centennial and 5th. Three separate shootings have happening just this month, one as recent as this past weekend where two kids were shot inside their home near Cheyenne and Decatur when two men opened fire. In November alone, a total of four minors have been shot. Two of them were killed in separate incidents. North Las Vegas Police says they are taking this rash of violence seriously. “Our detectives as well as our CSI on those scenes together to get as much evidence as they can to bring not just a suspect into custody and take a dangerous person off the streets, but to bring peace of mind and justice to the families," says Aaron Patty, North Las Vegas Police Department. The topic of gang violence is also not a secret in the north valley. Public Information Officer Aaron Patty says they have specific officers trying to tackle that issue. Police are asking for your help, too. As their officers work to track down criminals, police are asking for neighbors to be good witnesses as well. “When we get those tips and that information from the public its going to generate some leads for our detective that they otherwise didn’t have and will lead to an arrest of a suspect," says Patty.